Like East of India? Click here to view the entire range. Celebrate the wedding of two very special people in style. Show just how happy you are for them with this fabulous Wedding Gift Set, made exclusively by East of India. 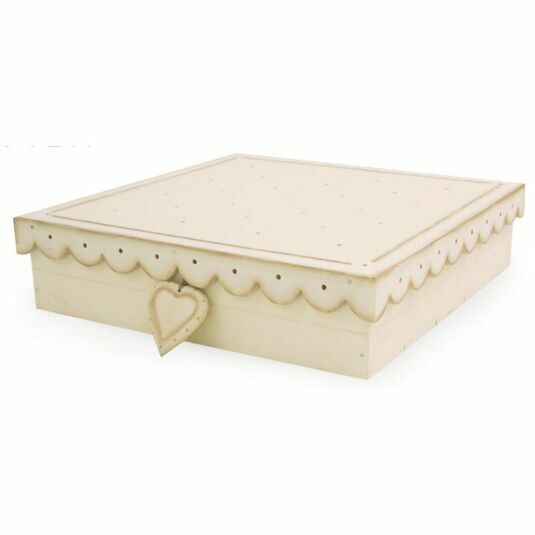 A Marriage Certificate holder which they can store their official documents. 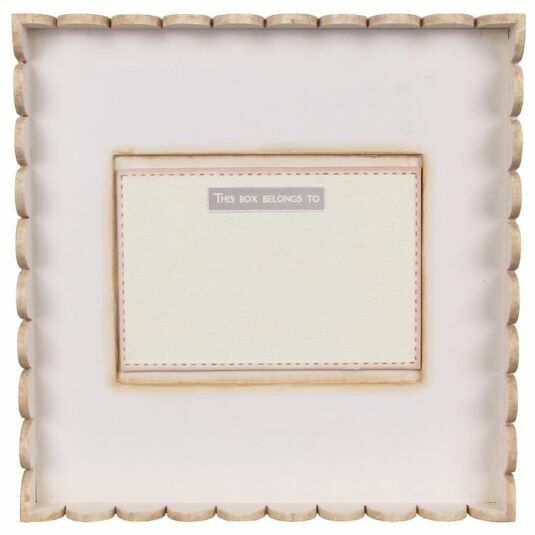 A cream Long Heart Frame which holds a standard 6x4 photograph of the happy couple. Its 19 x 13 cm. A stunning Hanging cream Heart 13cm x 6cm. 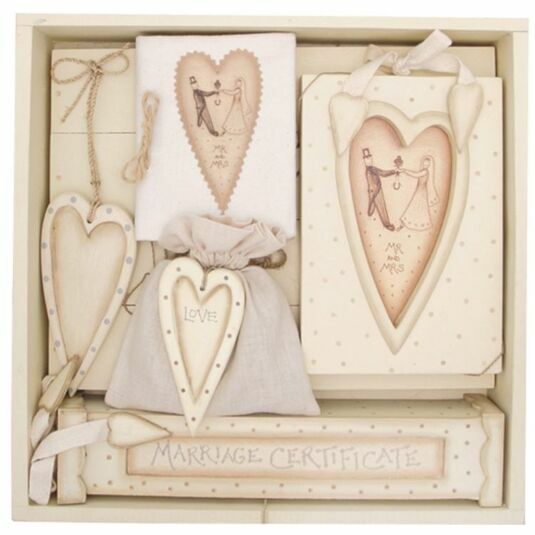 A Wedding book which is exclusive to this Wedding Gift Set. A small bag which is decorated with a beautiful small cream heart, with "Love" handpainted in the middle. This Wedding Gift Set is the ultimate gift for the happy couple. With a lid which securely fastens the contents, its presentation is superb. Add one to your basket today, and surprise the Love Birds! Our apologies, due to shipping restrictions, International Airmail delivery services are not available on this item. East of India remains one of the most popular brands on our website, sourcing gifts from across the globe that are beautiful, authentic, and unique. In 1989, founders Anne Spratling and John Ayris went travelling around the world, meeting a talented family of craftsmen while making their way through Asia. These artisans hand-made the most charming items out of paper, wood and other natural materials found near their village. And so after some close work and friendly bargaining, a selection of products was created, a small collection was bought, and the seed of an idea was sown. Early in 1991, the Prince's Trust forwarded a small loan to help transport that first consignment back to England and East of India was born. Today, East of India still works closely with those original artisans, who now employ numerous other family members and friends to satisfy the increasing demand. They design all their products around the extensive range of traditional skills that these craftspeople possess, and the products you see are the result of this close working relationship. Many of the artisans live and work together as family groups, passing down their skills through the generations. The team in Folkestone has also evolved and grown, with many members of staff having been with East of India since those early days. They continue to respond with energy and enthusiasm to the ever-changing requirements of what is now a hugely successful business, generating much needed wealth for some of the poorest communities in the world. The success of East of India lies in the personal touch of every single item they create. Products are developed in-house by a team of talented designers, with everything being hand-made or hand-finished to create unique and beautiful products with that instantly recognisable East of India style. It is the extensive skills of these artisans combined with the imagination of the Folkestone-based designers that is the key to why East of India and their products are so special and impossible not to fall in love with!